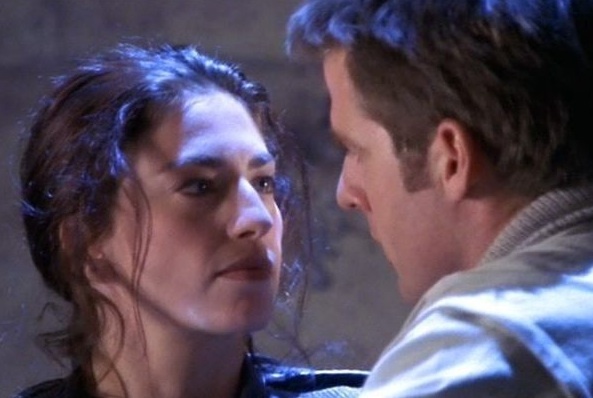 When we were first putting Dreampunk together and listing TV shows to eventually revisit for weekly reviews, the Jim Henson Company’s brilliant, imaginative, complex, utterly gonzo space opera, Farscape, was one of the very first that came to mind. In many ways, this mindbending science fiction phantasmagoria is one of the best examples of dreampunk out there. Although it’s about a modern-day scientist/astronaut falling through a wormhole and emerging on practically the other end of the universe, protagonist John Crichton might as well have been Alice tumbling through a rabbit hole into Wonderland, for all of the wondrous, bizarre, indescribable, Technicolor life he encounters in his quest to get back home. The show often even went directly inside Crichton’s increasingly fractured psyche, with psychedelic dream episodes and other zany forms of experimental storytelling galore, and madness being one of the series’ major recurring themes. It was an ingenious fusion of the silly and the sublime, with low humor such as bodily function gags often sitting effortlessly side by side with some of the most awe-inspiring, breathtaking, genuinely operatic space opera ever dreamed up, with each bizarre element somehow only enhancing the rest. Farscape is one of the strangest, most wonderful examples of epic narration in television history, and one I have revisited many times over the years, and I’m very excited to do so again for this series. Just one important note: If you are new to Farscape, you may NOT want to partake of these posts, as I plan on including major spoilers for later events. They are written not for the Farscape virgin but more for the viewer who–if not as obsessive about the show as I am–has at least seen it once through and can appreciate the bits of foreshadowing and long-term arc progression that the show sets up often far in advance. Many Farscape fans don’t love the pilot episode of the series. According to series creators Rockne O’Bannon and Brian Henson, they were originally hoping for it to be a two-hour episode, but the SciFi Channel (now Syfy) instead wanted to keep it at the regular length, and because of that, “Premiere” has to introduce an enormous amount of character introductions, worldbuilding, and plot setup in an extremely tight 50 minutes of television (and the 50-minute cuts of the first season only aired in the UK and overseas; SciFi’s cuts were 5 minutes shorter, to accommodate commercials, often causing American viewers to miss out on essential character moments). And it could be argued that, for a first dip into the Farscape world, it can all be a bit too much. There are even faithful Farscape fans today who admit to not having been sold on the show until much later in the first season, and while I agree that it would have been nice for the episode to have had more room to breathe, I also rather love how this episode forces both John Crichton and the viewers along with him to take a genuine plunge off the deep end. The time constraint forces the audience, on a first viewing, to feel just as emotionally whiplashed as Crichton, and although this certainly may not seem the most welcoming introduction, I find “Premiere” to be extremely impressive for what it does manage to accomplish and to play much better when one revisits the series a second (and third and fourth, etc.) time through. So much of the DNA of the series–as well as hints of future character arcs–is present, right there from the very start. The economy of the writing is also stunning. In a relatively brief teaser, the show manages to introduce us to John and give us a good initial feel for who he is as a person, as well as to establish his two strongest ties to Earth: his dad, and his best friend, D.K., with whom he developed the slingshot theory that he’s going up to test in the Farscape module. In a very short amount of time, we get a sense for who he’s going to be missing most when he finds himself “shot through a wormhole,” which is important (he’ll end this episode recording a message to his dad that he knows he may never be able to deliver to him, a motif which recurs in later episodes), as well as even his struggles with growing up as the son of a celebrity astronaut. The dialogue in the famous scene in which he denies to his dad that he’s nervous to be going into space, in order to seem more confident, and then admits that he always found it difficult to live up to everyone’s idea of his dad as an old-fashioned, national hero–he is following in his footsteps by going into space but to conduct an experiment, not to do anything as glamorous as walking on the moon–may be a tad on-the-nose, particularly when his dad reassures him that he may not be his kind of hero but that he will grow into his own kind of hero, but (a) the scene is played with such verisimilitude and honesty between Ben Browder and Kent McCord that it feels fully natural, and (b) it’s an idea that the series keeps revisiting thematically. In many ways, it describes Crichton’s entire series arc, in microcosm. It is the story of how John Crichton grows up (often painfully) and learns to become his own kind of hero. In the DVD commentary, O’Bannon and Henson discuss the casting process and why they ultimately chose Ben Browder for Crichton, and their answer is basically that he managed to hit a very difficult, rare balance of being classically sci-fi hero handsome but at the same time capable of being convincing as a brilliant scientist, and also a bit goofy and vulnerable at the same time. And, really, it’s incredible how perfectly Browder encompasses that role. He’s so effortlessly perfect in it that it can be easy to underestimate how much skill it takes. A great deal has been written about how Crichton is in many ways a very unusual, feminist hero in that, although he has some very stereotypically masculine traits–broad shoulders and arms, manly voice, seems like the type who’d like to kick back on the couch with a beer–the story often puts him in the stereotypically female position. Crichton doesn’t find himself in this new terrain and instantly exude stalwart confidence and macho pride. When he first hits Peacekeeper space, he is confused, out of his element, and even afraid. He may try to suppress those emotions at times, in order to try to be his dad’s kind of hero, but that’s not really who he is, underlined by his soon afterwards awakening in a cell, completely naked–again, put in a more stereotypically feminine, “weakened” position–and later overpowered by a hard-nosed female soldier. But more on that in a bit. Great review. I agree with all of your discussion of Premiere. I look forward to reading future reviews. It's safe to say, that by this review, you love and understand Farscape like a true fan. Can't wait for the next instalment.